Featuring world class luxury amenities miles away from the hustle and bustle of city life, The Khyber Himalayan Resort and Spa is beautifully enveloped by the wonders of nature. It is located at an altitude of 8825ft above sea level in the laps of the Himalayas with half of the rooms overlooking the Snow capped Apharwat range while the other half tenders a view of Gulmarg town. Its interiors reflect an awe-inspiring old world charm. Stretched over 7 acres of lush greenery with majestic sight of the valley and colorful flowers, it is indeed the perfect place that will urge you to return on every visit to Gulmarg. Accommodation The hotel offers 80 well appointed rooms, 4 opulent cottages and suites with breathtaking views of Apharwat peaks or of beautiful valleys. 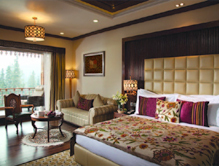 Each room is designed with traditional materials and displays excellent Kashmiri crafts. Tendering genuine and personalized service, it is a paradise of serenity and tranquility. Round the clock room service, tea/coffee maker, high speed wireless internet, hair dryer and television are some of the in-room amenities. 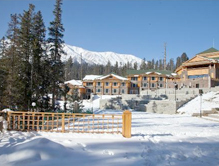 The hotel is well known for its endearing hospitality, impeccable service and mouthwatering delicacies making it the most sought after places to visit during the vacations in Gulmarg. Dining There is a restaurant called cloves, offering multi-cuisine delicacies to satisfy the craving of every guest. Each dish is made by the famous chefs who ensure that high quality food is served to the visitors.